Residents pack Thursday night's meeting of the Kittery Planning Board to discuss plans for Pepperrell Cove. 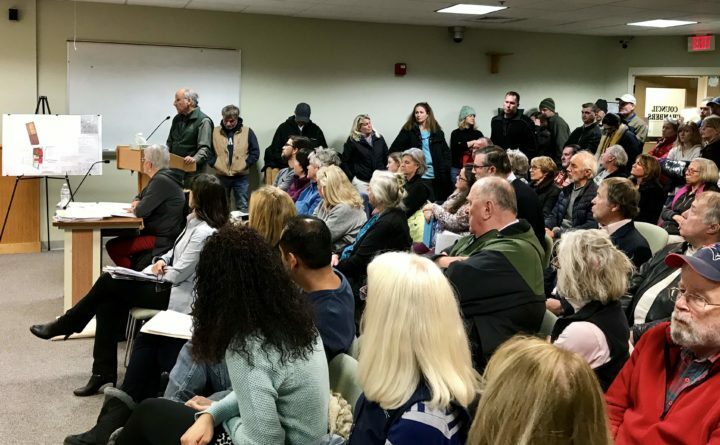 KITTERY, Maine — It was standing room only at Thursday night’s Kittery Planning Board meeting, where the Pepperrell Cove Group presented its updated parking plan, with the hopes of opening its last waterfront business, Bistro 1828, by the end of the month. After the Board of Appeals granted several variance requests Tuesday which resulted in relief from the town code’s requirements for parking lots, the Planning Board’s marathon meeting brimming with debate over landscaping, sidewalks and and even a nearby historic burying ground ultimately ended in an approval with many attached conditions. A group of local restaurateurs banded together to renovate and repurpose the historic complex formerly known as Frisbee’s Market and Cap’n Simeon’s Galley over the last two years. 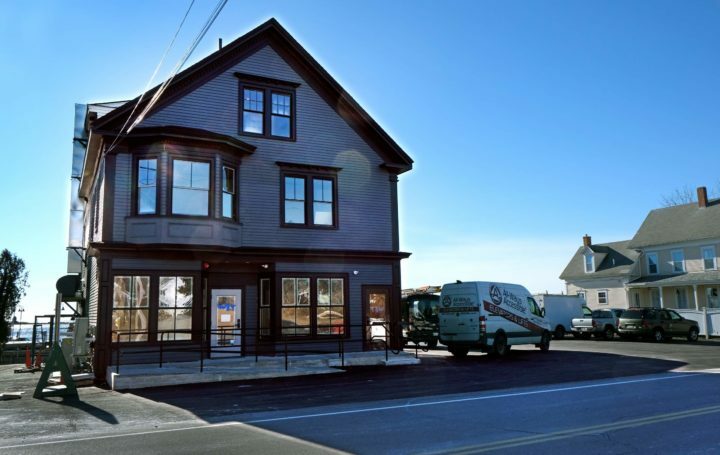 Now, four new businesses occupy the property, including a dockside restaurant called Frisbee’s Wharf, an event space called The View at Pepperrell Cove, a small general store named Provisions, and a two-story restaurant and bar called Bistro 1828. Bistro 828 is proposed to open soon at Pepperrell Cove in Kittery Point. The parking plan itself met town ordinance, by providing the required number of 81 parking spaces for the four businesses, but there were several specifications including lack of uniform paving and landscape buffering that didn’t satisfy the town code. Pepperrell Cove’s parking spans both sides of Pepperrell Road. Pepperrell Cove had previously been instructed to return before the Planning Board with a complete parking plan prior to the opening of their last establishment. Kittery’s Planning and Development Director Adam Causey said the project is a “great investment that people are excited about,” but some issues needed to be addressed in regards to quality of life for the historic Kittery Point neighborhood. He said on Tuesday, the Board of Appeals granted relief from a paving requirement, installation of trees per a certain number of parking spaces and lighting parameters. The Department of Public Works requested ADA-compliant sidewalks be installed along frontage of the commercial property on both sides, and town staff recommended approval with sidewalks as one of the nine conditions. The other conditions included curb stops, parking signs and a parking attendant on site during certain hours from May to October. Additional speakers expressed concern over the location of the proposed crosswalk, and potential infringement on a nearby burying ground. Next to the parking lot across the street is the 1720 Pepperrell Tomb, and the issue was raised at Thursday’s meeting that slave remains could possibly be buried around the tomb. Vice Chair Karen Kalmar made a motion to require the applicant to conduct an archaeological examination to determine if there are unmarked grave sites. “I don’t want to be the community who can’t be bothered to find out if we are parking our cars on dead people,” she added. While the room was generally in support of Pepperrell Cove’s business venture, there was much debate over the plan’s details. Planning Board Chairwoman Ann Grinnell said she wished the applicant success, but too much had been squeezed in in too little time. Board member Russell White said their alternative was to “stretch this out many more months and not necessarily come up with anything better than the staff would.” Ronald Ledgett said the board had identified the issues and “teed them up” to be properly addressed. Ultimately, the board approved the plan 5-1.